ultranationalist and outpoken genocide denier. Newly elected Serbian president, a right-wing ultranationalist extremist, known for being very fond of Serbia's Fascist roots and Serbian Nazi past in World War II, delivered a new twist to his ongoing controversy. This time, hardly any news, Nikolic engaged in denial of the Bosnian Genocide. The Bosniak chairman of Bosnia's tripartite presidency criticised Serbia's new rightist president, Tomislav Nikolic, on Friday for playing down the 1995 Srebrenica massacre of 8,000 Bosniak men and boys, Europe's worst atrocity since World War Two. Both the International Criminal Tribunal for the former Yugoslavia (ICTY) in The Hague and the International Court of Justice (ICJ) have ruled that the Srebrenica massacre was Genocide. "It is very difficult to indict someone and prove before a court that an event qualifies as genocide." Bakir Izetbegovic, who shares Bosnia's presidency with a Croat and a Serb, said such declarations were insulting to the survivors. "The denial of genocide in Srebrenica ... will not pave the way for cooperation and reconciliation in the region, but on the contrary may cause fresh misunderstandings and tensions," he said in a statement. Bosnian Serb forces under the command of General Ratko Mladic slaughtered around 8,000 Muslim men and boys after capturing the town of Srebrenica, declared a "safe haven" by the United Nations, towards the end of Bosnia's 1992-95 war. Mladic and the Bosnian Serbs' wartime political leader, Radovan Karadzic, are on trial in The Hague accused among other things of genocide for the killings. "By giving such statements, Nikolic has clearly demonstrated that he is still not ready to face the truth about the events that took place in our recent past," Izetbegovic said. Nikolic's shock win over incumbent president Boris Tadic sent a chill through a region that still recalls his last spell in government - as deputy prime minister in a coalition with Serbia's late strongman Slobodan Milosevic when NATO bombed Serbia to drive its forces out of Kosovo during a 1998-99 war. Nikolic has recast himself as a pro-European conservative since splitting in 2008 from his firebrand ultranationalist mentor Vojislav Seselj, who is also on trial for war crimes in The Hague, and has said he will pursue Serbia's drive for EU membership. A spokeswoman for European Union foreign policy chief Catherine Ashton said her office was trying to clarify Nikolic's statement. "But would like to remind everyone that Srebrenica has been confirmed as genocide by both the ICTY and the ICJ. Srebrenica was the largest massacre in Europe since World War Two, a crime against all of humankind. We should never forget and it should never be allowed to happen again," she said. 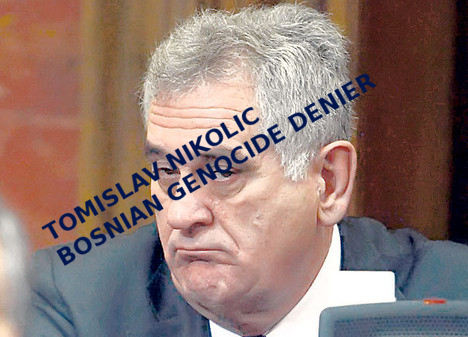 Nikolic also said that he would not attend the annual commemoration of the Srebrenica massacre in July. "Don't always ask the Serbian president if he is going to Srebrenica," he said in the interview. "My predecessor was there and paid tribute. Why should every president do the same?" Tadic oversaw the arrest and extradition of Karadzic and Mladic. He pushed an apology for the massacre through parliament and travelled to Srebrenica as part of a drive to foster reconciliation.